years of study and commitment to excellence. 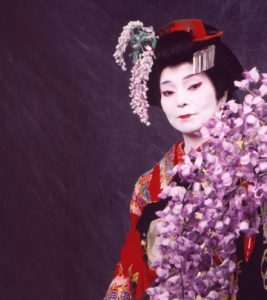 Wearing a range of costumes from elaborate to simple kimonos, her face and hands are powdered brilliant white for classical dances, or highlighted with simple make-up for traditional folk and popular selections. The dances are usually scenes or a series of sketches depicting a character in conflict or blissful harmony; and showcase movements that are highly stylized, earthbound, and close to the body. Her graceful movement and powerful imagery evoke emotions and truths that lie at the heart of all cultures. A student of Japanese dance for over twenty years, Onoe Kikuyuki holds the Natori Certification (to perform) and the Shihan Certification (to teach) granted by the most distinguished Onoe School of Japanese Dance, Tokyo, Japan. 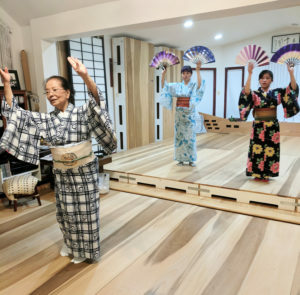 The Onoe School is critically acclaimed throughout Japan as the recognized leader in preserving Japanese culture by inspiring traditional choreography with creative assimilation of diverse artistic genre from the modern world. She is the master instructor and choreographer for Kikuyuki No Kai , a traditional dance group.